Now that your baby has grown into a child who’s able to brush on their own, you’ll want to make sure that they’re doing everything correctly. Luckily, you shouldn’t be expected to do it entirely on your own. 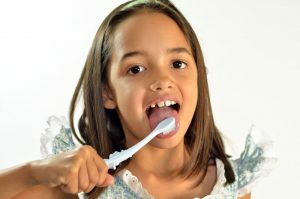 According to your children’s dentist in Hillsboro, there are right and wrong ways to approach oral care, both at home and when visiting your dentist. Once you have these tips in mind, keeping your child’s oral health on track will be simple! While you should still supervise your child during their daily oral care, they can begin brushing their teeth themselves by the age of three. Just make sure that they don’t swallow too much toothpaste in the process. When applying toothpaste, be sure to only use a pea-sized amount at a time. Using any more is unnecessary, wasteful, and only increases the likelihood that they’ll swallow more. It’s very important that they brush twice a day for at least two minutes each time, ideally at the same time every day. This will help them establish a habit more quickly. If they struggle to floss, consider purchasing handheld floss picks. Not only will this make flossing easier and protect them from decay, but they can also come in multiple colors and even animals shapes, making oral care more fun. This goes for their toothpaste and toothbrushes as well. Let them pick out the ones you’ve determined will properly fit their hands and mouths. Many dentists fail to acknowledge the importance of a healthy diet for oral care. According to your dentist, having three balanced meals throughout the day, rather than many snacks, is a more effective way to reduce decay in between brushing and flossing. Eating meals in this way helps your child produce more saliva, which works to wash away loose oral bacteria and remineralize teeth exposed to acids. Another important part of daily oral care is staying hydrated. Your child needs to be drinking enough water to avoid dry mouth, which makes it easier for bacteria to grow and spread. By the time they reach 18, they’ll also understand that their dentist can help them catch early signs of disease, including systemic disease that’s often unrelated to oral health. With these three tips in mind, your child’s oral health will remain in good condition for years to come. To get started, schedule an appointment with your children’s dentist in Hillsboro today! Dr. Michael C. Royse is a board-certified Diplomate of the American Board of Dentistry who has over 18 years of experience practicing as a dentist for kids in Hillsboro. To learn more about his preventive care or oral health tips, contact him through his website.